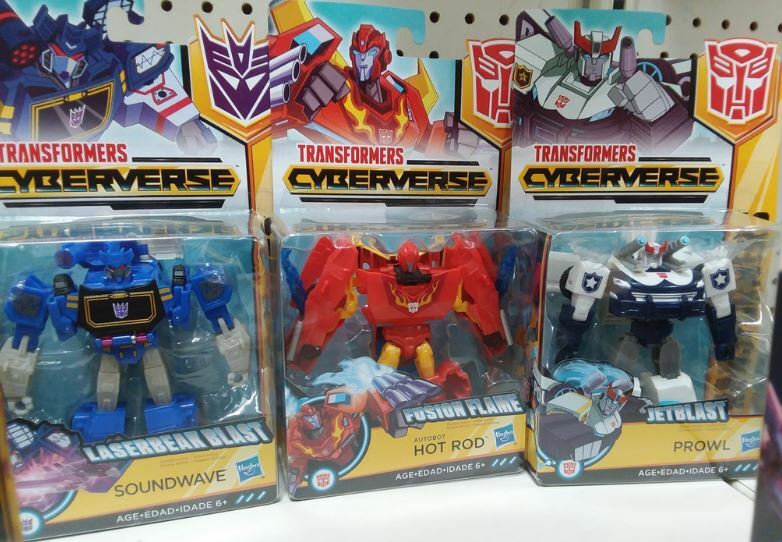 Good hunting to our fellow Transformers fans in Texas, with TFW2005 member Houstonian Prime finding Cyberverse Warriors Class Wave 3 figures Hot Rod, Prowl and Soundwave on shelves at a Houston Walmart. here's a pictorial review for hot rod..
From the stock photos I have seen I have a horrible suspicion that Prowl has no elbow articulation and his arms are at a permanent ninety degrees at that point. I'm going to go for 2 Prowls. 1 to be my Prowl, 1 to be a Barricade custom. How much are these figures anyways? Quick, someone post a review of Prowl so I know whether he’s as crushing a disappointment as the other warrior classes. For future reference, just bookmark this thread for all your UPC barcode needs! Hard to find any of these online. Anyone else see "Cyberverse Warriors" and suddenly want a Dynasty Warriors-style game with Transformers? "Do not pursue Lu Bu Devastator!" TBH when I see the name Lu Bu I think of Fate, especially Extella, as that was pretty much a Dynasty Warriors game and that exact line appears at one point. saw these guys today, minus soundwave. geeeez…. glad i already have my definitiveversions of these guys….